Gold medallists at the Liebherr 2017 World Championships in Düsseldorf, it is on the shoulders of Maharu Yoshimura and Kasumi Ishikawa that the greatest hopes of success at the forthcoming Seamaster 2018 ITTF World Tour Lion Japan Open exist. They are the top seeds in the Mixed Doubles event; play commencing in Kitakyushu on Friday 8th June, being preceded immediately by a two day qualification tournament which commences on Wednesday 6th June. Mixed Doubles Final world table tennis championships in Dusseldorf. 29 May 6 june 2017. Furthermore, they are not the only pairing on duty in Kitakyushu that advanced to the latter stages two years ago in Düsseldorf. Most notably the runners up are in action, as are three of the four semi-finalists. Silver medallists Chen Chien-An and Cheng I-Ching appear on the entry list as does the pairing they beat in the penultimate round; that of Hong Kong’s Wong Chun Ting and Doo Hoi Kem. Both pairs appeared last week in Shenzhen, both departed in the quarter-finals. 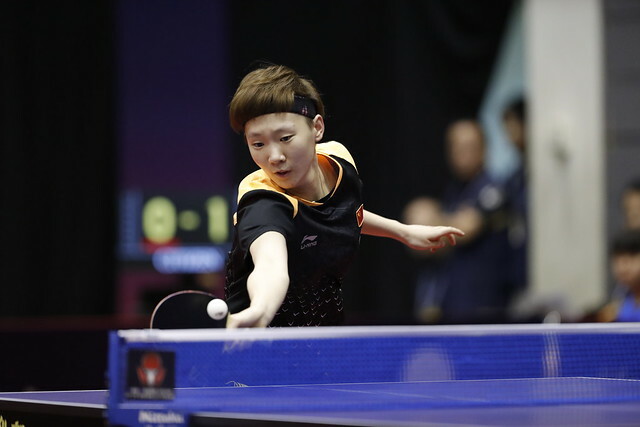 Wong Chun Ting and Doo Hoi Kem lost to China’s Lin Gaoyuan and Chen Xingtong, Chen Chien-An and Cheng I-Ching experienced defeat at the hands of Korea Republic’s Lim Jonghoon and Yan Haeun. In Kitakyushu, Wong Chun Ting and Doo Hoi Kem are the second seeds followed by Chen Chien-An and Cheng I-Ching. Likewise on duty last week in Shenzhen but experiencing an opening round defeat at the hands of China’s Zhang Jike and Wang Manyu; Ho Kwan Kit and Lee Ho Ching, also from Hong Kong, reserve the fourth seeded place in the draw. Success in Düsseldorf and there are two further pairs present in Kitakyushu who reached the latter stages at the Liebherr 2017 World Championships. Both from Europe, Sweden’s Mattias Karlsson and Matilda Ekholm, alongside Spain’s Alvaro Robles and Galia Dvorak advanced to the quarter-finals. At the Seamaster 2018 ITTF World Tour Lion Japan Open, Mattias Karlsson and Matilda Ekholm are the fifth seeds, Alvaro Robles and Galia Dvorak are named in the qualification tournament but will receive a direct entry to the main draw. Notably, the pairs who reached the final last week in Shenzhen do not appear. Neither Masataka Morizono nor Mima Ito, the runners up and reigning Japanese national champions, are listed; for Chen Xingtong who partnered Lin Gaoyuan to gold, she has a new partner. She joins forces with another member of the Chinese national team, Liang Jingkun; they are the no.8 seeds. However, with home support, could Tomokazu Harimoto and Miu Hirano, who like Alvaro Robles and Galia Dvorak are named in the qualification stage but are guaranteed a main draw place, be a major force? Equally, could the pair to watch be that of China’s Yu Ziyang and Wang Manyu? Last week a left hand and right handed pairing won in Shenzhen; Yu Ziyang and Wang Manyu are very similar.